Copyright: © 2017 Alkhayat K, et al. This is an open-access article distributed under the terms of the Creative Commons Attribution License, which permits unrestricted use, distribution, and reproduction in any medium, provided the original author and source are credited. Pulmonary dysfunction is a common feature in patients with long standing liver affection and up to 70% of patients with liver cirrhosis are complaining of dyspnea. Hypoxia has been seen in approximately one third of patients with chronic hepatic disease and the development of hypoxemia in patients with chronic liver disease may change the treatment. Pulmonary dysfunction is a common feature in patients with a long standing liver affection and more than 70% of patients with liver cirrhosis are complaining of dyspnea. Hypoxia has been found in one third of patients with chronic liver disease and presence of hypoxemia in patients with chronic liver disease may change the treatment . There is no definite mechanism explaining the association between liver disease and hypoxemia and many factors play a role in its pathogenesis. Although none of them have been proven as the sole reason, nevertheless ascites, hepato pulmonary syndrome, extreme hepatomegaly low albumin levels, anemia, increased closing volume and respiratory muscle weakness are still considered among the factors implicated in the pathogenesis of hypoxemia in cirrhosis . Many factors for pulmonary abnormalities in liver disease have been recognized including cardiopulmonary disorders not related to hepatic affection as well as unique problems associated with the presence of hepatic disease and/or portal hypertension . The aim of our study is evaluation the degree of pulmonary function abnormalities in patients with liver cirrhosis and its relation to the Child-Pugh classification. Patients were categorized according to Child-Pugh classification by clinical and sonographic evaluation of ascites, clinical evaluation of encephalopathy and laboratory evaluation of serum bilirubin, serum albumin and INR. Patients with primary lung diseases, pleural diseases, patients with advanced hepato cellular carcinoma (beyond Milan criteria), and patients receiving medications e.g. (B blocker) were excluded. We got approval of Sohag Faculty of Medicine Ethical Committee. All patients signed an informed written consent before starting data collection with respect to patient’s confidentiality. • History taking, general and abdominal examination. • Laboratory study: Aspartate amino transferase (AST), Alanine aminotransferase (ALT), serum albumin, prothrombin time and concentration, total & differential bilirubin, hepatitis markers for HBV and HCV, blood sugar, Hb, serum creatinine, serum sodium and serum potassium. Using The Child-Pugh score : Three tests (bilirubin, albumin, and prothrombin time), with the presence and severity of encephalopathy and ascites, are included in the Child-Pugh score. The Child-Pugh score is given by the sum of the score (1 to 3) of each of the five parameters. A score of 6 or lower defines the patient as class A, 7 to 9 as class B, and 10 or higher as class C.
To evaluate liver (size, echogenicity and any focal lesion), portal vein, spleen, portosystemic collaterals, and detect ascites . The subject performs a standard forced vital capacity maneuver (FVC), inspiring fully to Total Lung Capacity (TLC), then exhaling as rapidly and forcibly as possible to residual volume (RV). To complete the loop, the subject inspires as rapidly as possible from the maximal expiratory level back to maximal inspiration. This spirogram is produced by computer generated graphics using Sensor Medics V max 229 . Every patient performed the loop three successive times and the one with the best performance was chosen. No bronchodilators were received. • Forced vital capacity (FVC). • Forced expiratory volume in the first second (FEV1). • Forced expiratory volume in the first second (FEV1) to the forced vital capacity (FVC) percent. Data were analyzed using STATA intercooled version 12.1. Quantitative data were represented as mean, standard deviation, median and range. Data were analyzed using student t-test to compare means of two groups and ANOVA for comparison of the means of three groups or more. Multivariate linear regression was done to determine the factors affecting lung functions. Graphs were produced by using Excel or STATA program. P value was considered significant if it was less than 0.05. Seventy seven patients (85.56%) were males and 13(14.44%) were females. Their mean age was 58.01 ± 8.21 years, 16.67% of them were smokers (Table 1). Table 1: Characteristics of studied population. Clinical features of studied population showed that dyspnea was evident in 50 patients (55.56%), central cyanosis in 7 patients (7.78%), ascites in 43 patients (47.78%), jaundice in 10 patients (11.1%), and orthopnea in 34 patients (37.78%) (Table 2). Table 2: Clinical features of studied population. The mean values of percentage predicted, standard deviation of each parameters in relation to child score are shown in Table 3. Table 3: Pulmonary functions in different child classes. Patients were categorized equally into three groups according to Child-Pugh scoring; each group contains 30 patients. 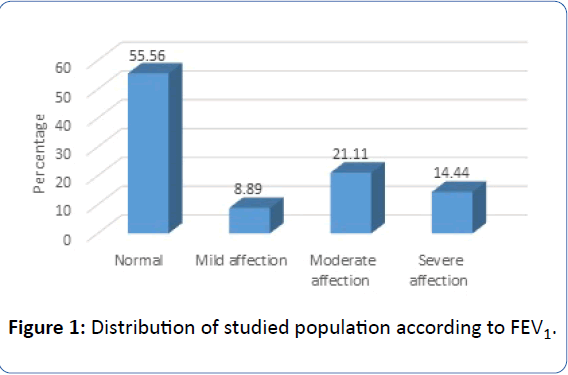 • FEV1% (Forced expiratory volume in 1 second) was normal in 55.56% of studied population, 8.89% had mild affection 21.11% had moderate affection and 14.44% had severe affection as shown in Figure 1. Figure 1: Distribution of studied population according to FEV1. 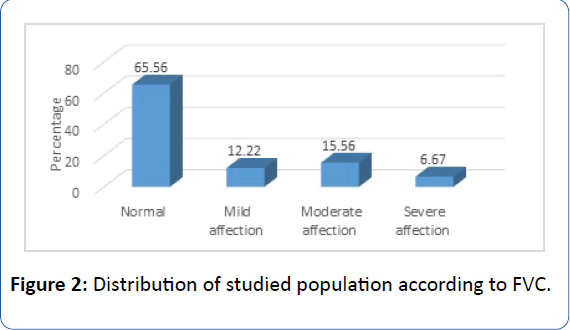 • FVC% (Forced Vital Capacity) was normal in 65.56% of studied population, 12.22% had mild affection 15.56% had moderate affection and 6.67% had severe affection as shown in Figure 2. Figure 2: Distribution of studied population according to FVC. 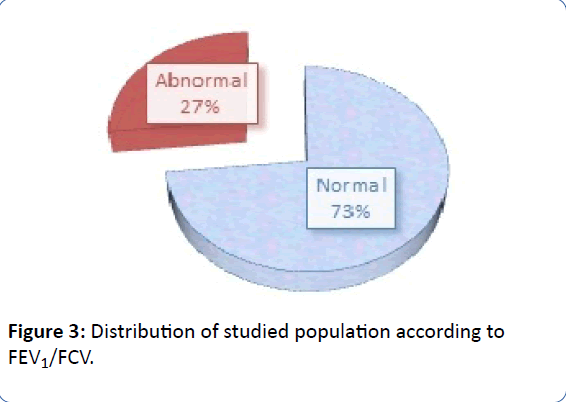 • FEV1/FVC was normal in 73% of studied population and abnormal in 24 patients (27%) as shown in Figure 3. Figure 3: Distribution of studied population according to FEV1/FCV. • There was a direct significant (positive) correlation between FEV1% and Serum albumin in the studied patients (R=0.56, P<0.0001) (Figure 4). 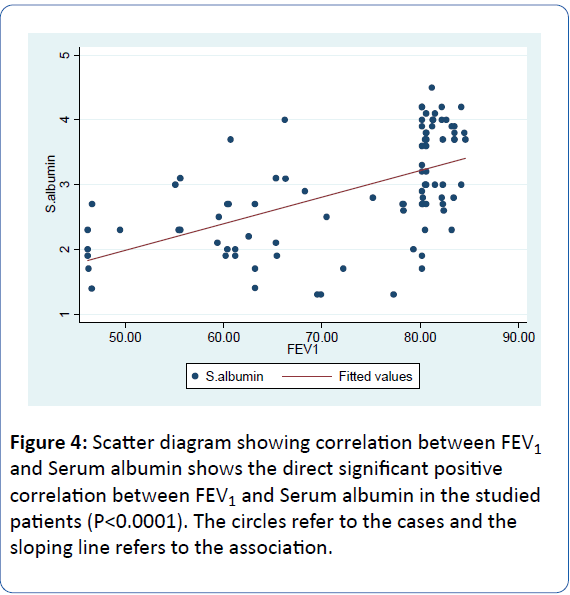 Figure 4: Scatter diagram showing correlation between FEV1 and Serum albumin shows the direct significant positive correlation between FEV1 and Serum albumin in the studied patients (P< 0.0001). The circles refer to the cases and the sloping line refers to the association. • There was a statistically significant association of FVC% in cirrhotic patients with Child scoring (R=-8.21, P=0.0001) shown in Figure 5. 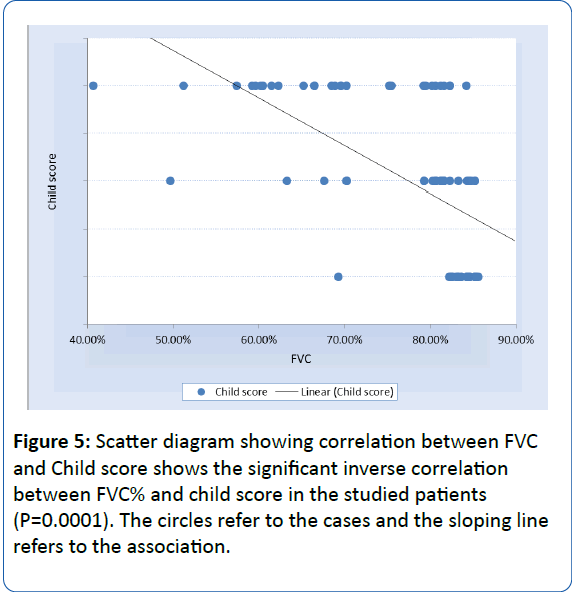 Figure 5: Scatter diagram showing correlation between FVC and Child score shows the significant inverse correlation between FVC% and child score in the studied patients (P=0.0001). The circles refer to the cases and the sloping line refers to the association. • There was a highly significant positive correlation between FVC% and Serum albumin in the studied patients(R= 0.59, P<0.0001) (Figure 6). 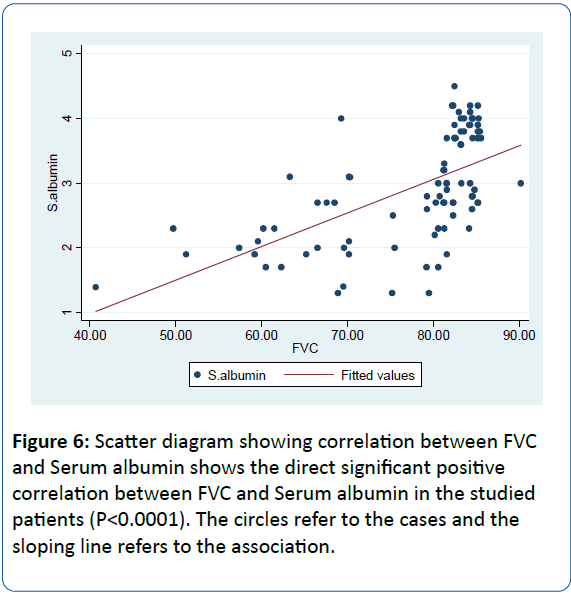 Figure 6: Scatter diagram showing correlation between FVC and Serum albumin shows the direct significant positive correlation between FVC and Serum albumin in the studied patients (P< 0.0001). The circles refer to the cases and the sloping line refers to the association. Liver cirrhosis is associated with abnormalities in pulmonary function may occur in as many as 45-50% of patients. Although mechanisms of impaired pulmonary function include an intra or extra pulmonary shunt, ventilation-perfusion mismatch, and diffusion defect, there is no agreement on which factors are most likely. Hepato pulmonary syndrome (HPS) is a serious problem of hepatic cirrhosis that occurs in 5-32% of patients with cirrhosis [1,6]. Our study was undertaken to analyze the pulmonary function tests in patients with liver cirrhosis. Respiratory function test ; forced vital capacity (FVC), forced expiratory volume in the first second (FEV1) and its percent of forced vital capacity (FEV1\FVC). In our study, we found that 50 patients out of 90 cirrhotic patients complaining of dyspnea (55.56%), this was confirmed by Krowka et al. who reported that dyspnea is a common symptom in chronic liver disease. The dyspnea dates back an average of five years before the accurate diagnosis of HPS. This indicates that dyspnea is a common complaint in patients with cirrhosis. Moreover, some complications of liver disease can cause dyspnea include pulmonary hypertension, hypoxemia, ascites anemia, abdominal distention, and pleural effusion, the cardiomyopathy of advanced liver disease can also cause dyspnea [9,10]. In the present study, FEV1 and FVC values were discovered to be less in the Child–Pugh C group. Comparing of the previous two parameters between the groups was found to be highly significant (P=0.0001). This was in agreement with Vachiery et al. who found in his study on one hundred and twenty patients with hepatic cirrhosis that 70% of patients with HPS were in the C stage, and he documented that the most valuable criterion used in determining the prognosis in cirrhotic patients is the Child-Pugh classification, which indicate the degree of liver cell failure. The pulmonary changes discovered in cirrhotic patients are related to the degree of hepatic affection . The present study showed direct highly significant positive correlation between FVC and serum albumin in the studied patients (P<0.0001). This was agreement with a study carried out by Helmy and Awadallah ; that showed a statistically significant decrease in serum albumin in hypoxemic patients in comparison to non-hypoxemic patients. Also these results agree with Melot et al. who showed a decreased serum albumin in hypoxemic patients. Low serum albumin may contribute to hypoxemia through causing subtle interstitial edema which leads to impaired diffusion of alveolar O2 . This work might point to the pulmonary function abnormalities in patients with liver cirrhosis leading to a significant restrictive and obstructive ventilatory defect at the level of both small and large airways. Zhang J, Fallon MB (2012)Hepatopulmonary syndrome: Update on pathogenesis and clinical features. Nat Rev GastroenterolHepatol 9: 539-549. Krowka MJ, Cortese DA (1987) Severe hypoxaemia associated with liver disease: Mayo Clinic experience and the experimental use of almitrinebismesylate. Mayo Clinic Proc62:164-173. Pugh RNH, Murray-Lyon IM, Dawson JL (1973)Transection of oesophagus for bleeding oesophagealvarices. Br J Surg 60:646-649. AASLD (2009)Management of adult patients with ascites due to cirrhosis: An update. Hepatology 4: 2087-2107. Al-Ashkar F, Mehra R, Peter J (2003) Interpreting pulmonary function tests: Recognize the pattern, and the diagnosis will follow. Cleve Clin J Med 70: 866-868. Abrams GA, Nanda NC, DubovskyEV (1998) Useofmacroaggregatedalbumin lung perfusion scan to diagnose hepatopulmonary syndrome: A new approach. Gastroenterology 114:305-310. Abo-Youssef H (1986) Respiratory function studies in bilharziasis with special reference to transfer factor. MD Thesis (Chest), Cairo University. Krowka MJ, Dickson R, Wiesner RH (1992)A prospective study of pulmonary function and gas exchange following liver transplantation. Chest 102:1161-1166. Kwo PY (2012) Shortness of breath in the patient with chronic liver disease. Clin Liver Dis16:321-329. Adams KF, Lindenfeld J, Arnold JM (2006)Heart Failure Society of America (HFSA) Comprehensive heart failure practice guideline. J Cardiac Failure 12: e1-e122. Vachiery F, Moreau R, Hadengue A(1997) Hypoxemia in patients with cirrhosis: Relationship with liver failure and hemodynamic alterations. J Hepatol 27: 492-495. Alberts WM, Salem AJ, Solomon DA(1991) Hepatic hydrothorax cause and management. Arch Intern Med151: 2383-2388. Helmy A, Awadallah M (2014) Study of pulmonary dysfunctions in liver cirrhosis. Egypt J Chest Dis Tuberc 63: 1079-1085. Melot C, Naeije R, Dechamps P (1989) Pulmonary and extrapulmonary contributors to hypoxaemia in liver cirrhosis. Am Rev Respir Dis139:632-640. Abrams GA, Sanders MK, Fallon MB (2002) Utility of pulse oximetry in the detection of arterial hypoxemia in liver transplant candidates. Liver Transpl8: 391-396.